Today's woman is always on the go. From chemistry class to gym class, yoga to an early morning board meeting, life seems to be getting busier and busier. SweetSpot Labs is simplifying your cleansing routine. No time to shower? No problem! SweetSpot Labs On-the-Go Personal Wipes offer a convenient way to cleanse and refresh for your sweet spot, and whole body. Bursting with natural ingredients like aloe, cucumber, pineapple and cranberry extracts, these feminine wipes fight odor while delivering a pH balanced clean wherever you go. Help us take care of our environment. 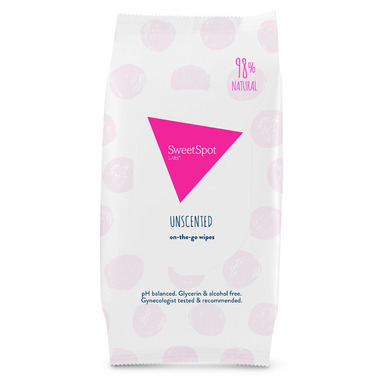 SweetSpot Labs Personal Wipes are biodegradable and compostable, wipe and toss responsibly. Directions: One wipe per use, and toss. Smile all day. For External Use Only. If rash or discomfort develops, discontinue use. I bought these after seeing on Instagram. Ordering from well.ca they were on sale for half price and the shipping was free! I had just had shoulder surgery so these came in handy, I had use of only one arm. They feel so clean and refreshing on the skin. They can be used as an all over wipe. I tried the sensitive first before any other scent, have tried others since and there is no sensitivity to any. I love these wipes and continue to buy from this site. They are available locally but price is higher. I highly recommend these!